The most profound outcome of the WTO protests is the appearance of the netwar construct in American politics. The "Battle in Seattle" was fought not only in the streets, but also in the infosphere. 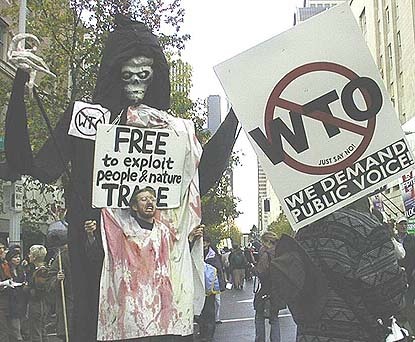 The WTO protests were the first to take full advantage of the extremely dense and wide-reaching alternative media network which uses the internet. The use of "media special forces" is one of the hallmarks of netwar and informational conflicts. With the rise of the alternative media, it is no longer possible for mainstream forces to control the information reaching the public as occurred during the Gulf War, for instance. The WTO protests were the Chiapas insurrection come to America. Like the Zapatista netwar, the conflict was one of networks versus markets. The role of institutions, be they police or military forces, NAFTA, WTO, or political administrations, was secondary to the conflict. Institutions intermediate netwar conflicts, but they are not the primary actors. In Seattle, the police were not going to decide the issue; they were only going to determine the level of violence. As it turned out, the introduction of new "non-lethal" armaments such as chemical irritant sprays and pellets, guns firing a variety of rubber, wooden or "bean-bag" projectiles, "robocop" armor, and all the rest, were not only ineffective but actually counter-productive in dealing with non-violent protesters. In most cases, protesters were only infuriated and stiffened in their resistance by the use of these weapons. The widespread use of "non-lethal" weapons increased the agressiveness of police and the increased combativeness eroded strategic control. This aspect of the street battles deserves serious consideration by law enforcement and protest planners alike. The flexible and improvised communications infrastructure used by the Direct Action Network was a significant feature in the protests. One of the dictums of netwar is that netwar actors have a much greater interest in keeping communications working, rather than shutting them down. The dense and diversified communications used by the Direct Action Network could not have been significantly harmed by any action less than a total media and communications blackout in Seattle. Not only is such an action impossible for the economic and social costs which would result, but a blackout of the required magnitude would be the informational equivalent of unconditional surrender by the establishment. Future protests will be even more information intensive. Both protesters and their opponents will have to come to terms with the implications of netwar and the struggle for information, understanding and "topsight." Because the ultimate prize in a netwar conflict is understanding, not opinion, it is the quality of information, not the quantity, which determines the final outcome. The essential conditions for victory in a netwar conflict are also the conditions which make waging netwar possible: the shared understanding of a situation which demands direct action. In many ways, the victory of the Direct Action Network was implicit in the fact that so many people understood the conflict and were willing to act on that understanding. The streets of Seattle showed what democracy looks like.